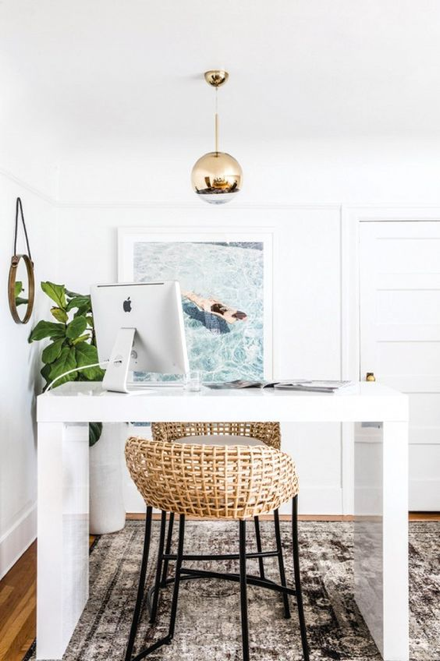 There are so many beautiful elements that can create a beach vibe, and the beauty is that you can combine so many other elements from other design styles to make your beachy/coastal inspired office unique! Traditionally, coastal and beach inspired spaces combine light colours and use a lot of light to create a fresh, vibrant atmosphere! 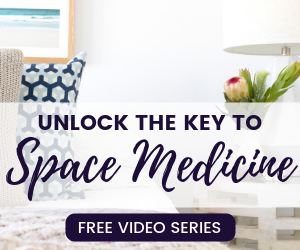 It is a great way to bring the outdoors indoors which can be extremely stimulating for the mind, especially in an office space, creating space medicine. 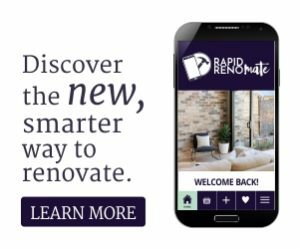 Blues, tans, browns and greens are often introduced into the space for this effect. A lot of texture is also found in coastal areas with sand, glass, timber, rope and textiles. 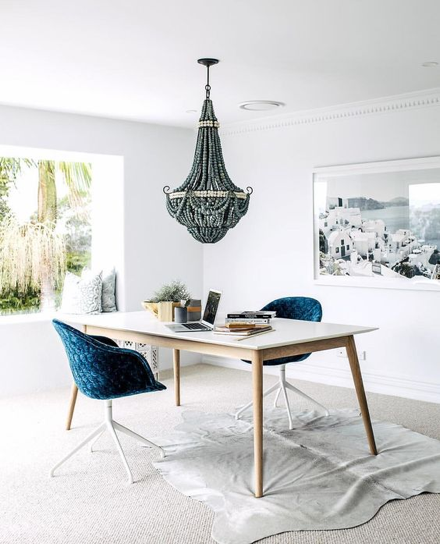 Chic coastal/beach inspired office spaces can contain some regency features such as brass which connects as part of the sand and sun and a lot of white pieces of furniture and accessories are also used. 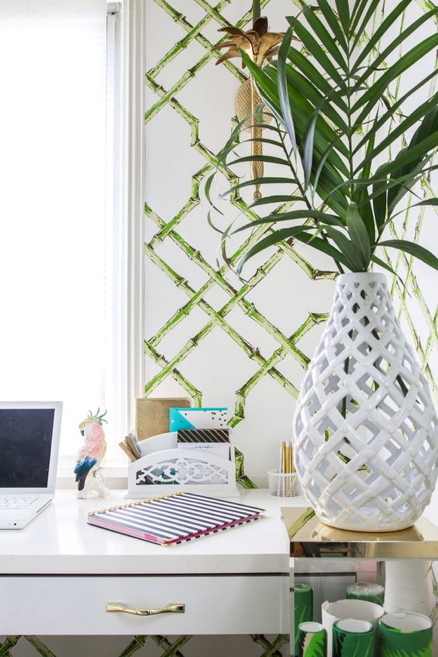 Pattern always plays a huge role in the creation of a chic space, so the green bamboo wallpaper and the lattice vase are a match made in heaven. Introducing greenery such as ferns will always pull together a coastal appearance. 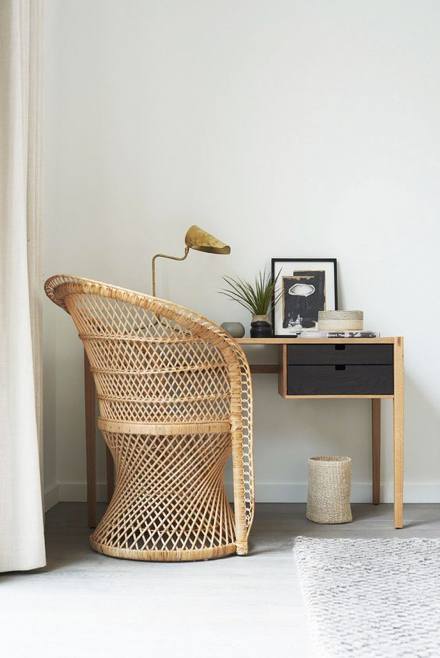 Minimalist beach/coastal rooms are very popular for a pared back vibe. 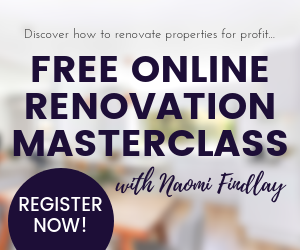 This means that the furniture needs to shine, not necessarily the room itself. Lots of texture should be introduced to balance with the minimal style. In minimalist styles, colour isn’t introduced on a large scale, if at all, so warmth is essential in textiles and timbers which compliment the coastal style. French Provincial elements can be introduced into a beach/coastal space for a more romantic and antique style. 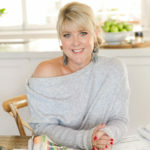 Timbers and linens are always popular in French Provincial design and a lot of curvy pieces of furniture are brought in. Elegance is shown in turned timber legs on pieces of furniture and buttoned linen pieces. Layers of texture are introduced to balance out a loss of colour. 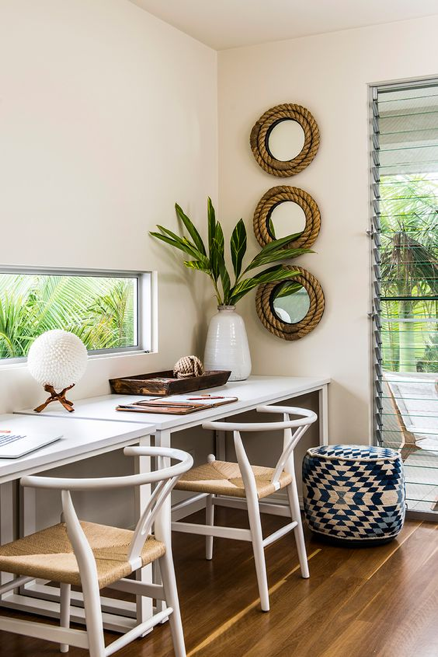 Traditional elements like rope, timber, weaved/rattan furniture and palms and greenery are extremely versatile elements that can be introduced to create a beachy/coastal office space in a very modern design. Bohemian elements are extremely rustic – especially when it comes to timber. 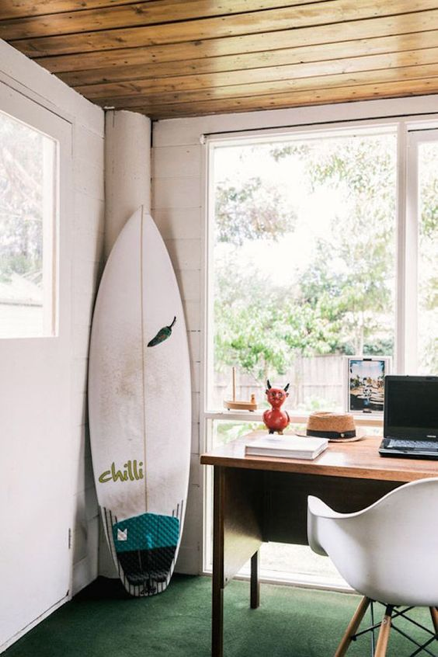 It is always a great way to create a unique office space, the rustic timber can relate back to beautiful pieces of driftwood. 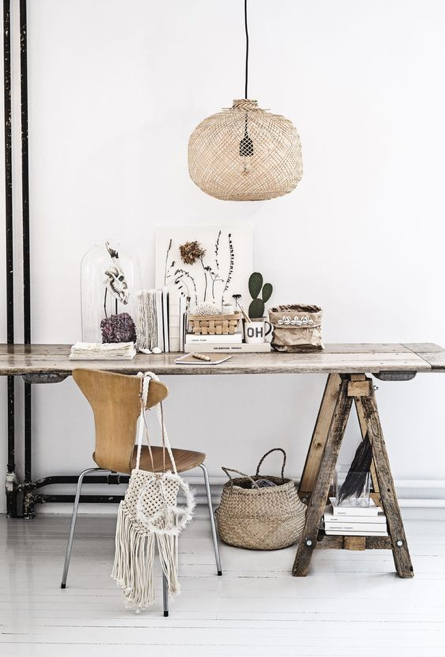 Complimented with the rope textures and muted colour tones, it creates a beautiful space to thrive in!